What all is going on this week? Not much, aside from a metric ton of excellent content created by Protagonize members. Got any good creative writing or “choose your own adventure”-style photos or links? Send them my way (via email or by commenting here) and I’ll post them in our next roundup! You wake up. Nothing unusual about that, six billion people on Earth do it every single day. Except, with those swirling loops of light above your head, you can’t entirely be sure you’re on Earth. “Help” comes a faint cry. From this distance (given you’re still barely awake you can’t be sure what distance this is), it’s hard to tell if it’s a man, woman or a very clever dog. As you get up, you notice the floor smells of fudge. That’s because it is fudge, you realise. You look around. Sure enough, you are surrounded by fudge demons. What do you do? What do you do? Rac7hel has posted 4 stories and 11 branches or chapters, as well as 5 comments of her own, and has tallied a stupendous rating of 4.70 from 40 total ratings by other Protagonize members. Nice work, Rac7hel! This week has been a busy one, but I managed to crank out a few updates throughout the site; most notably, the featured content on the homepage and the main stories page has been switched up a bit. As per the blog post from earlier this week on the subject, the Featured Story has moved over to the main Stories page, to make room for news updates on the homepage. I made this change because I didn’t think enough people were seeing the updates from our blog, and it also balances out the main Stories nicely. Finding balance in life (and in user interfaces) is always good. :) On top of that, now you can follow the latest Protagonize happenings via our Twitter feed, right there on the homepage. On top of that, I’ve also spent a good chunk of this week submitting Protagonize for consideration in a variety of awards shows. The most notable of these is the Prix Ars Electronica, a prestigious digital arts competition that takes place at the Ars Electronica Festival in Linz, Austria every year. Protagonize was nominated by one of the Prix’s advisors this year in the Digital Communities category, and we’re honoured to be submitting ourselves for consideration for a Golden Nica by the Prix’s esteemed jury. To cap this week’s roundup off, I just wanted to let you all know that I’m constantly amazed by the great writing produced by our members… here’s hoping it only gets better! In the meantime, please spread the word about Protagonize (hit that “share” link on our Facebook product page and get your friends to sign up! ), and be sure sign up on the site and subscribe to our blog at http://blog.protagonize.com/. 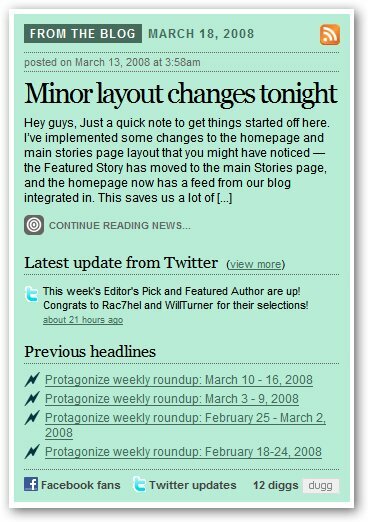 This entry was posted in Features, General, Press, Site updates, weekly roundup and tagged about.com, Features, Press, protagonize, Publishing, techvibes, twitter, weekly roundup. Bookmark the permalink.